This vintage style ring displays a flower scroll design that is adorned with glittering round diamonds. 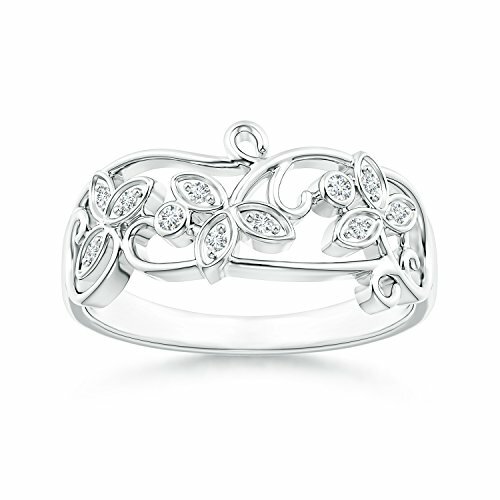 Set in 14k white gold, the nature inspired pattern of this impeccably crafted piece of jewelry is sure to captivate. Available in various sizes between size 3 to 13.5 Please contact us for more info. Angara deals only in conflict free diamonds. Conflict-free diamonds are guaranteed not to be obtained through the use of violence, human rights abuse, child labor, or environmental destruction. Angara completely supports the Kimberley Process, which is an International process to track and certify diamonds.